Ida May finally fits in at school after becoming best friends with Stacey Merriweather, who is universally liked by their classmates. But then Ida?s frenemy, bossy Jenna Drews, brings in a game of truth or dare, and all the girls are suddenly daring one another to misbehave. When Ida finds herself in the principal?s office, she?s scared into ratting out her friends and gets freezed out of the group. The only way she can fix things is to take a triple-dog dare: letting one of the girls pierce her ears. 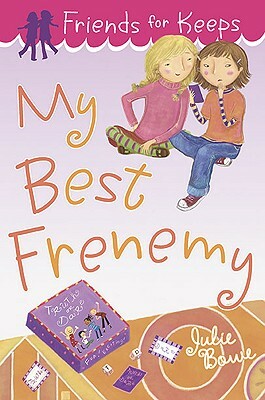 Will her BFF come to her rescue, or is this the perfect job for a frenemy? Packed with fourth-grade jealousies, problems, misbehavior, and consequences, this third book about Ida May stands on its own. Julie Bowe is a full-time author who knows how to strum a guitar, play a really good game of foosball, and had her first story published in fifth grade when she entered a contest in the local newspaper and won first place! Julie is the author of the "Friends for Keeps" series and lives with her family in Wisconsin.